I must admit, I’ve already been making this vegan chanterelle mushroom gravy for over a week. However, only now did I manage to get it filmed, shot and up on my blog. It makes me ever so happy to finally share this amazing, simple and healthy recipe with you. Now, I love this time of the year! I literally want to jump of joy when I go to market and see all this fresh produce in abundance. The choice is actually overwhelming and it gets difficult at times not to buy mindlessly. Chanterelles almost always end up in my bag! When I think back, I’ve always loved mushroom sauce. However, conventionally it is made with butter, cream and/or white flour making it a very high-fat food. It is a total waste of the precious mushrooms, if you ask me! 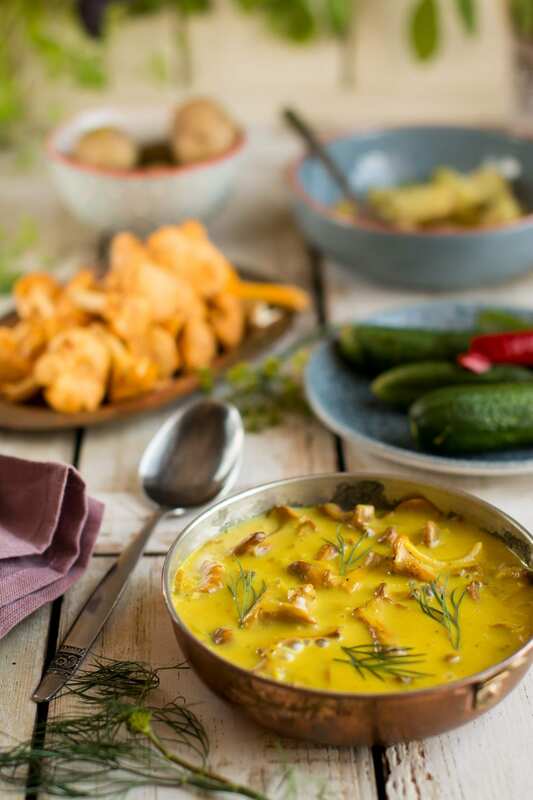 Now, my vegan chanterelle mushroom gravy is so delicious and creamy yet oil-free and even gluten-free. You won’t need to compromise with taste or texture. Why I don’t use cooking cream in my vegan chanterelle mushroom gravy. I know it’d be easier to use the ready vegan cooking creams, but… Have you ever read the ingredients and nutritional info of those creams? Well, I have! Even if I take one of the best and most natural brands (naming no names), it’s still very high in fat. Now, on the package they proudly declare – 13% fat. Seams quite low and harmless, right? However, what does it really mean? It actually means that 100 grams of the product contains 13 grams fat (23% of which are saturated). What I really want to know is the percentage of calories from fat. And that is… 78% of calories come from fat! Now, if that is not extremely high-fat food, then I don’t know what is. How did I come up with this number? Here you go: 100 grams of the product contains 150 kcal. Now, knowing that every gram of fat contains 9 kcal, you’ll easily get that 13 grams of fat gives 117 kcal, which makes it 78% of total calories. Easy-peasy, right? To end at a more merrily tone, I’d like to go back to my childhood. 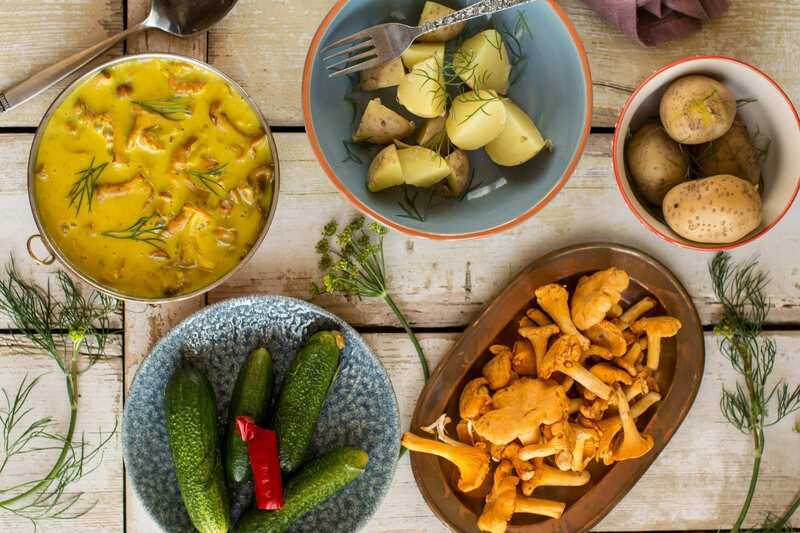 I don’t know about where you come from, but here in Estonia the smell of freshly salted cucumbers, boiled young potatoes, fresh dill, and tomatoes and of course chanterelle sauce is one of the main indicators of summer. I remember it so clearly from my childhood! Today I gladly enjoy my healthy vegan chanterelle gravy over those goodies with plenty of greens aside. 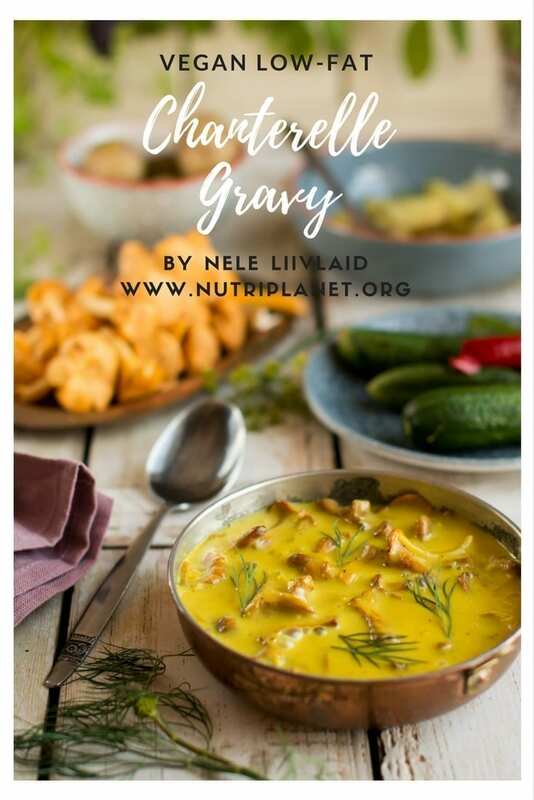 And last but not least, my vegan chanterelle mushroom gravy is gluten-free, oil-free, low-fat and Candida diet friendly. First, clean your chanterelle mushrooms. Next, take a small pot or saucepan and add cleaned chanterelles, onion flakes, garlic and 2 tbsps. of water. Sauté covered for 5 minutes mixing a few times making sure the onion and garlic absorb water. When the 5 minutes is up, add 1 tsp. of turmeric, mix well and sauté for another 5 minutes. Meanwhile, in a small bowl or cup, whisk together 1 tbsp. of tapioca flour and ⅓ cup of plant milk. Make sure the mixture is smooth with no lumps. Pour 1 cup of plant milk onto your chanterelles and mix well. Finally, when the gravy almost starts to boil again, whisk in the tapioca/milk mixture stirring vigorously. Keep on stirring until the gravy starts to boil. Then, turn off the heat and leave it to cool without lid allowing it to thicken further. Nutritional info, calculated with ⅓ cup oat milk and 1 cup of almond milk (½ of the recipe): 120 kcal, 15g carbohydrates (66.4% of kcal), 2.91g fats (21.9% of kcal), 3.53g protein (11.8% of kcal), 4.85g fibre, and 9.67 GL points. 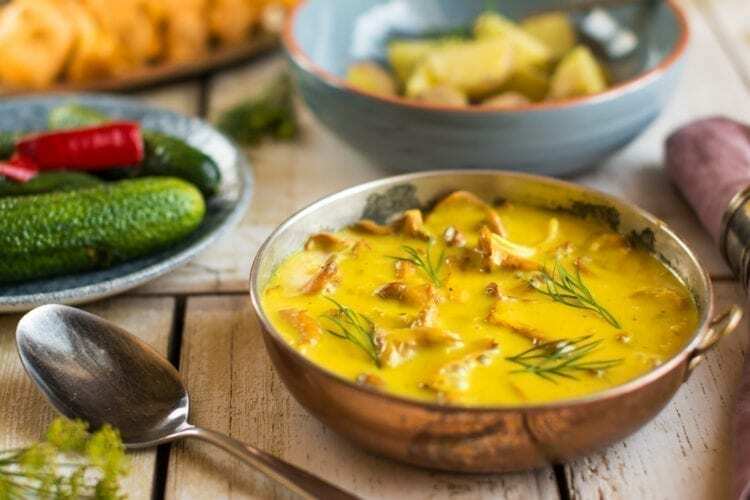 What to eat this vegan chanterelle mushroom gravy with? Use it as pasta sauce and you’ve got yourself a delicious and creamy chanterelle pasta dish. It also works amazingly well as salad dressing. Just pour the chanterelle gravy over your salad or Buddha bowl, mix it up and start munching! Get salad idea from Chickpea Dhal recipe! And of course, chanterelle gravy with freshly boiled young potatoes, salted cucumbers, tomatoes and fresh dill makes an absolutely divine summery meal. Instead of dried onion and garlic, you can also use fresh. Just take a small onion and a few garlic cloves, dice them up and sauté as per instructions above. Except, use only 1 tbsp. of water (or even less). As far as plant milks go, I used ⅓ cup oat milk and 1 cup of unsweetened almond milk. Now, the milks you use determine the sweetness of your chanterelle gravy. Consequently, if you use only oat or rice milk, you’d get a rather sweet gravy with higher GL. This is why I prefer the combo of almond and oat. Almond milk is leaner and has lower GL compared to soymilk whereas oat milk gives just the right amount of sweetness. Tapioca flour can be easily substituted with potato or corn-starch (1:1). Furthermore, you could even use rice or buckwheat flour. Finally, should you have any leftovers, store it in a sealed container in fridge for 3-4 days.